BAG at Passenger Terminal Expo (PTE) 2019 - Stand 6120! British Aviation Group is pleased to announce the return of the increasingly popular BAG stand sponsorship packages at Passenger Terminal Expo, taking place in London 2019. 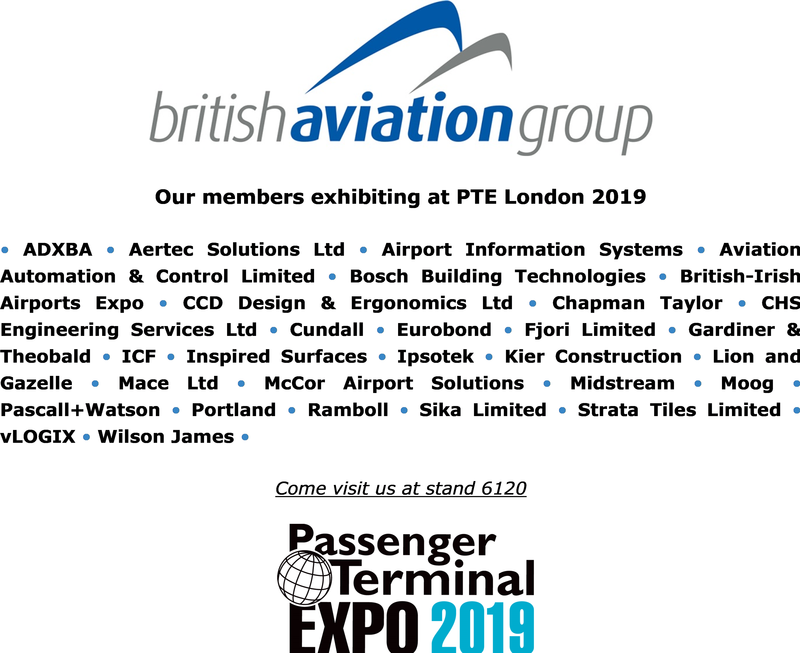 Over the years the BAG stand at PTE has grown considerably, becoming one of the main networking hubs for the aviation industry to meet and do business. This is due to our BAG member companies sponsoring the stand and drawing in the interest and key players in the industry. The show itself sees over 7,000 visitors from over 100 countries attend and spans across 17,000 sqm of space - making this one of the biggest airport shows in the aviation event calender. For 2019, the BAG stand is positioned in a prime location in the centre of the exhibition hall and surrounded by other well-known British primes. BAG are delighted to announce that we are a proud sponsor of PTE this year and we have 29 member companies sponsoring the BAG Stand. Please do make sure you come and say hello to the BAG team and to BAG Members! DIT post are hosting one to one meetings and briefing sessions during Passenger Terminal Expo. For more information on this meeting, please click here. For more information on this briefing and One to One meetings, please click here.